This paper is about ‘Design and the Tools of the Table, 1500–2005’ curated as part of the Cooper Hewitt exhibit on utensils. The collection impressed Professor Goldstein so much that she decided to work on the exhibit. The fork was the late comer to the dinner table; the fork didn’t take off as quickly and spoons and knives came first. Forks were initially used for carving and to stabilise a piece of meat, not so much as a personal implement. A manuscript from the eleventh century shows the Italian monks at Monte Casino eating with a two-tined fork, but the use of it as a table tool began in Byzantium in the sixth century. The Church reinforced the idea of the fork not being a necessary table implement. It lacked the appropriate symbolism that other utensils contained; i.e., the knife cut the bread of the last supper and the spoon was associated with the Virgin Mary. There are depictions of the Virgin Mary feeding baby Jesus with a spoon and the association has trickled down to modern times with the “Christening Spoon”. Forks entered into Western culture through Italy. Botticelli depicted the fork with beautiful ladies at a banquet. How did forks begin to be used for more than carving? The Sucket. Sucket was preserved or candied fruit, and very popular in the Early Modern period and the Renaissance. Suckets were very sticky and noble women did not want to get their fingers dirty so they used tiny forks to spear them. The fork did not reflect anything heathen or devilish, it reflected good breeding. When it was first introduced into France, and in England in 1608, the fork was considered very feminine. As late as 1738, in Ireland, Jonathan Swift noted that “fingers were made before forks and hands before knives” so it wasn’t until the later eighteenth century that the fork became standard. Chic and well to do people carried their own travelling utensils. The cases were ornately decorated, made of finely worked leather and were a way to show wealth and breeding. One of the most frequent questioned asked of Professor Goldstein is how did the number of tines in the fork develop? Early forks were very flat, less bowl shaped and really meant for spearing. Ergonomics and new foods came into play in deciding the design of the fork. In France, peas became the rage and more tines meant you could have more food on your fork. A popular style was Hanoverian and also the pistol handle cutlery set. George Washington had a set of pistol handle utensils. Using a fork was considered an affectation, and Washington was accused of “abandoning the ways of democracy”, by using a fork! What changed this perception? In the early nineteenth century, silver plating was discovered around the area of Sheffield, England. Utensils no longer had to be pure silver, they could be plated and thus became affordable. By the 1850’s, forks were in widespread use in the United States. Using a fork was no longer a mark of distinction, and the aristocracy had a lot of anxiety around this change and had to complicate matters. Silver companies capitalised on this anxiety and different forks were produced for different kinds of foods. The class distinction came into play when you knew what fork to use on what items and also where the correct placement of the utensils were on the table. There were bread serving forks, fish serving forks, fruit forks, and turtle forks (terrapin) that were spoon-like for scooping soups and recalled the shell of the turtle in their design. 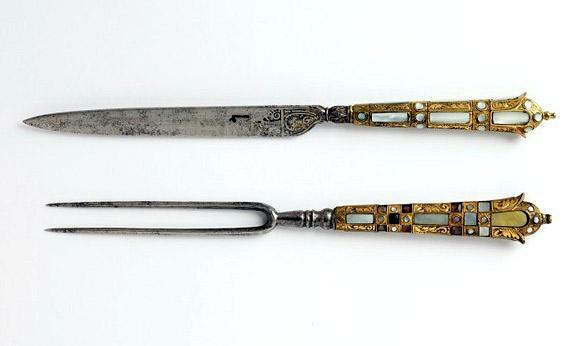 There were also lobster forks, sardine forks, caviar forks, olive forks, lettuce forks (so as not to bruise the lettuce), and pasta servers etc… Many forks were not necessarily all that useful (like the caviar and lobster fork) but they were made for market to show off the owner’s class. When pasta was all the rage, Thomas Jefferson brought back pasta machine designs from Italy. A traditional utensil set had 140 pieces, so for twelve people, you had to purchase over 1500 pieces! This excessive number was vastly reduced in later periods. Professor Goldstein went through slides and descriptions of various forks from early periods to modern day. For her final display, she showed the audience a modern fork from Hong Kong that costs $99 USD called, “The Happy Fork”. You plug the fork into your smartphone and programme it so that it buzzes when you overeat and it tells you how many calories you consumed!